I can't believe that this STYLE post is already my third Wantable style edit. Time truly goes by so fast! In the last 6 months, I have been receiving Wantable style edits bi-monthly, and to be completely honest, I am very impressed. 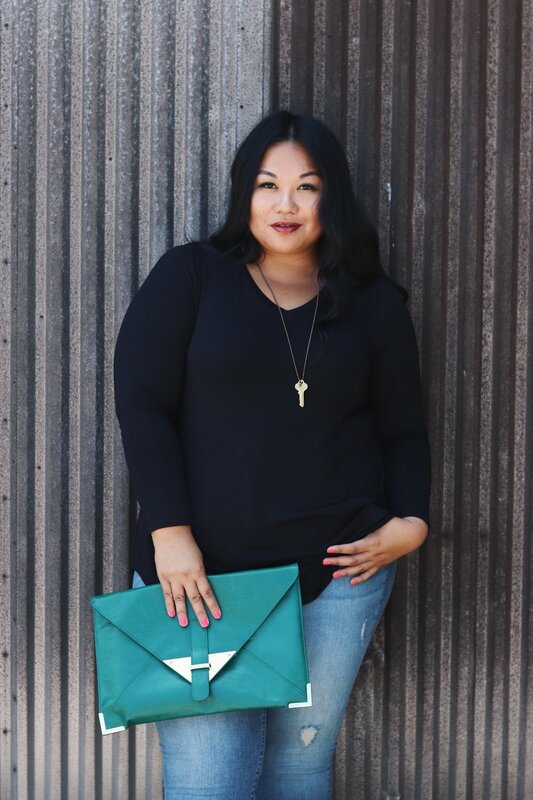 My personal style tends to lean over the statement-centered, clean and trendy look with a sprinkle of urban yet Wantable style edits adds ideal, buildable classics to my wardrobe that I fail to purchase whenever I am at the mall. Below are my favorites for amazing in-between season pieces that are perfect for days that shines like Summer, and cool nights that are reminders of the upcoming Fall season. And if you haven't yet, make sure to check-out Wantable and start building your wardrobe right from the comforts of your home with quality essentials that are naturally, Wantable. I just have to get it out there, but why does this particular shoot remind me of a wanna-be indie Country album cover? Nonetheless, this look is a proof that classics never die! Wantable sent over this light and soft black v-neck top perfect as a stand alone or to be easily layered. And these jeans. Oh these jeans feel so dreamy, just like my favorite go-to yoga pants. I threw on some cute clogs, added a pop of color, a minimal necklace, and I was ready to hang out with my favorite. Oh hi, Vavez. My Wantable personal stylist raved about this dress in her letter and I can't blame her! A timeless Americana design, this dress is best for Summer but also a breeze to layer on a denim jacket with. The body-con fit and the hi-low design adds a little modern flare to this staple. This dress was my choice for a slow and sunny Sunday around town and was an easy one-piece to look put-together and uncompromising comfort. Hands down, this outfit from this month's Wantable style edit is my favorite. 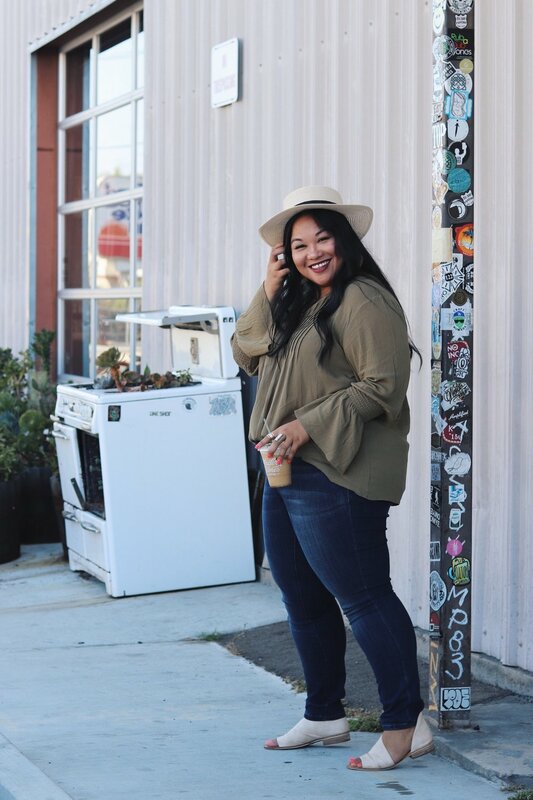 This olive flowy top was popular in our IG stories and I am not surprised. I adore the relaxed fit of this top, the bell-sleeves detail and the color olive is a must-have neutral. I also briefly raved about Wantable's jean selections on our IG stories and to be clear- Wantable's jeans selections from my last three style edits passed with flying colors and that says A LOT coming from these thunder thighs!